2016 is well underway and I found myself due for a relaxer touch up. Since I've stopped counting the number of weeks between my relaxer touch-ups I didn't remember when the last touch up was. 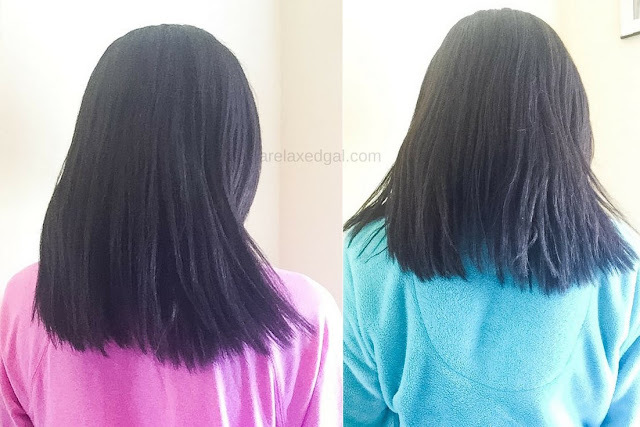 So I had to look back at my last relaxer touch-up post to see when my last touch up was. Even doing that I couldn't figure out the exact date, but I determined it was in October. This put me between 15 and 17 weeks post. This was a little longer than I planned to go, but I didn't have any issues with the two hair textures which is why I wasn't in a hurry to schedule an appointment. My hair felt great, really moisturized and smooth. But after 24 hours my scalp itched like crazy. I wasn't sure why, though I suspected the black tea. I couldn't live with the itching so I washed my hair again. This time around I decided to co-wash.
My hair didn't feel as moisturized like it did after my first wash, but my scalp felt so much better! The itchiness was gone. This is where the issue started. I told her before she started applying the relaxer that I didn't want my hair to be bone straight and she said she understood. Well, she left the relaxer on several minutes more than I would have liked. 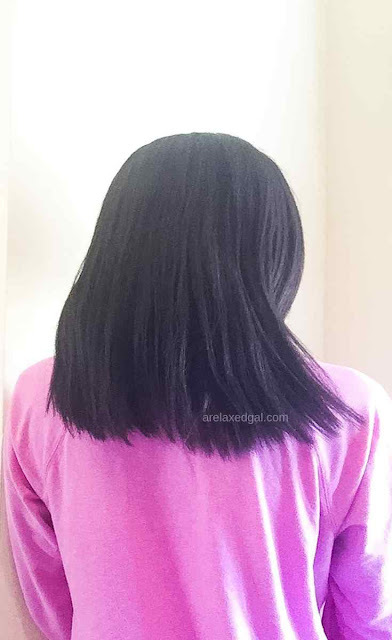 Not only that she kept smoothing it and applied the relaxer to more than two inches of hair. It looked like it was probably closer to 4 inches, so I'm pretty sure I got some overlapping. The stylist did trim my hair like I asked. I only wanted to even up my ends and that's what she did so I didn't lose a lot of length. Because she got my hair really straight my hair looked flat. Much flatter than I like it to look. I tried to combat the flatness by washing my hair three days later and adding some curls. But my hair still had a flat look. That flat look persisted over the next few weeks. Something else I've been experiencing that I think could be a result of my relaxer touch up. My hair isn't holding moisture between my washes. I typically wash my hair about once a week and between washes I'll apply moisturizer if my hair starts feeling dry. That has been working well for me, until after my touch up. The only other reason I can think about my hair being dry is there's a lot of build up, so I'm going to try using a sulfate or clarifying shampoo to see if that helps. I went back to this stylist because she doesn't complain about the amount of new growth I have, unlike others I've gone to. Now with this negative experience, I'll have to decide if I want to try her again or start over on my search for a stylist. To try and minimize the damage I believe happened during my relaxer touch up I've been focusing on layering moisture and protein. For my wash days, I'm continuing with my deep conditioning, using a moisturizing shampoo and using Aphogee 2 Minute Keratin Reconstructor. So far I haven't seen a lot a breakage like anticipated. I'll continue doing the moisture and protein layering for a while. How did your last salon visit go? YOur ends looks amazing. I don't like when stylist do their own thing. Try clarifying or even a medium protein treatment. Thanks Tomes! I am surprised at how good my ends look even though I've been wearing my hair down more. I've used the Aphogee Reconstructor a couple of times and am now using a shampoo with sulfates which seems to cleansing my hair a little more than my sulfate-free shampoos. I'm also thinking about getting a chelating shampoo.